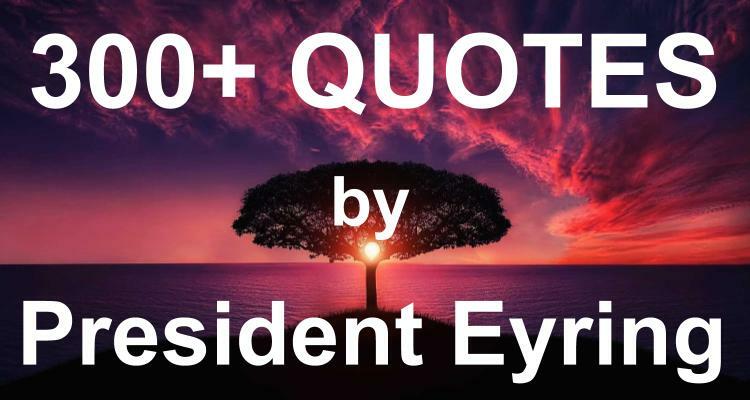 Here are 300+ of the best quotes by President Henry B. Eyring, organized by topic (A-Z). These quotes represent some of President Eyring’s most powerful messages from General Conference talks, First Presidency messages, BYU Devotionals, etc. You can and must be an important part of His giving comfort to those who need comfort. You can play your part best if you know more of how He answers those prayers for help. Many are praying to Heavenly Father for relief, for help in carrying their burdens of grief, loneliness, and fear. Heavenly Father hears those prayers and understands their needs. The burdens His faithful servants must carry in life are made lighter by His Atonement. The burden of sin can be taken away, but the trials of mortal life for good people can still be heavy burdens. The Lord has asked each of us, His disciples, to help bear one another’s burdens. We have promised to do it. I bear my testimony that the Lord, through His Atonement and Resurrection, has broken the power of death. I give my witness that the living Christ sends the Holy Ghost, the Comforter, to those we are pledged to help Him comfort. His love never fails, and we never will cease to feel in our hearts the urge “to mourn with those that mourn … and comfort those that stand in need of comfort.” Nor will the peace He promises ever leave us as we serve others for Him. You promised that you would help the Lord make their burdens light and be comforted. You were given the power to help lighten those loads when you received the gift of the Holy Ghost. If we have faith in Jesus Christ, the hardest as well as the easiest times in life can be a blessing. In all conditions, we can choose the right with the guidance of the Spirit. And with prophets revealing to us our place in the plan of salvation, we can live with perfect hope and a feeling of peace. We never need to feel that we are alone or unloved in the Lord’s service because we never are. We can feel the love of God. The Savior has promised angels on our left and our right to bear us up. And He always keeps His word. I cannot promise an end to your adversity in this life. I cannot assure you that your trials will seem to you to be only for a moment. One of the characteristics of trials in life is that they seem to make clocks slow down and then appear almost to stop. There are reasons for that. Knowing those reasons may not give much comfort, but it can give you a feeling of patience. It is never too late to strengthen the foundation of faith. There is always time. With faith in the Savior, you can repent and plead for forgiveness. There is someone you can forgive. There is someone you can thank. There is someone you can serve and lift. The ground must be carefully prepared for our foundation of faith to withstand the storms that will come into every life. That solid basis for a foundation of faith is personal integrity. One night I prayed for a test to prove my courage. I can remember it vividly. In the evening I knelt in my bedroom with a faith that seemed almost to fill my heart to bursting. Within a day or two my prayer was answered. The hardest trial of my life surprised and humbled me. It provided me a twofold lesson. First, I had clear proof that God heard and answered my prayer of faith. But second, I began a tutorial that still goes on to learn about why I felt with such confidence that night that a great blessing could come from adversity to more than compensate for any cost. With all the differences in our lives, we have at least one challenge in common. We all must deal with adversity. My purpose today is to assure you that our Heavenly Father and the Savior live and that They love all humanity. The very opportunity for us to face adversity and affliction is part of the evidence of Their infinite love. God gave us the gift of living in mortality so that we could be prepared to receive the greatest of all the gifts of God, which is eternal life. Then our spirits will be changed. We will become able to want what God wants, to think as He thinks, and thus be prepared for the trust of an endless posterity to teach and to lead through tests to be raised up to qualify to live forever in eternal life. The Lord will rescue His faithful disciples. And the disciple who accepts a trial as an invitation to grow and therefore qualify for eternal life can find peace in the midst of the struggle. There is yet another trial which, when endured well, can bring blessings in this life and blessings forever. Age and illness can test the best of us. I bear you my testimony that God the Father lives. He set a course for each of us that can polish and perfect us to be with Him. I know from my own experience that He can and will give us strength to rise through every trial. This is the Lord’s true Church in which we are, with Him, lifting each other and being blessed to succor the fellow sufferers He places in our way. The restored gospel of Jesus Christ gives us help in knowing how to qualify for the strength of the Lord as we deal with adversity. It tells us why we face tests in life. And, even more importantly, it tells us how to get protection and help from the Lord. We have trials to face because our Heavenly Father loves us. His purpose is to help us qualify for the blessing of living with Him and His Son, Jesus Christ, forever in glory and in families. To qualify for that gift we had to receive a mortal body. With that mortality we understood that we would be tested by temptations and by difficulties. Go to your meetings, even when it seems hard. If you are determined, He will help you find the strength to do it. What looked hard, almost impossible under her own power, became a joy in the strength of the Lord. I served as counselor to a wise district president in the Church. He tried to teach me. One of the things I remember wondering about was this advice he gave: “When you meet someone, treat them as if they were in serious trouble, and you will be right more than half the time.” I thought then that he was pessimistic. Now, more than 40 years later, I can see how well he understood the world and life. As time passes, the world grows more challenging, and our physical capacities slowly diminish with age. It is clear that we will need more than human strength. So many things beat upon us in a lifetime that simply enduring may seem almost beyond us..It can surely seem that way to a family depending on crops when there is no rain. They may wonder, “How long can we hold on?” It can seem that way to a youth faced with resisting the rising flood of filth and temptation. It can seem that way to a young man struggling to get the training he needs for a job to support a wife and family. It can seem that way to a person who can’t find a job or who has lost job after job as businesses close their doors. It can seem that way to a person faced with the erosion of health and physical strength which may come early or late in life for them or for those they love. But the test a loving God has set before us is not to see if we can endure difficulty. It is to see if we can endure it well. We pass the test by showing that we remembered Him and the commandments He gave us. And to endure well is to keep those commandments whatever the opposition, whatever the temptation, and whatever the tumult around us. Knowing why we are tested and what the test is tells us how to get help. We have to go to God. He gives us the commandments. And we will need more than our own strength to keep them. Again, the restored gospel makes plain the simple things we need to do. And it gives us confidence that the help we need will come if we do those things early and persistently, long before the moment of crisis. The first, the middle, and the last thing to do is to pray. Another simple thing to do, which allows God to give us strength, is to feast on the word of God: read and ponder the standard works of the Church and the words of living prophets. There is a promise of help from God that comes with that daily practice. Faithful study of scriptures brings the Holy Ghost to us. I know that God the Father lives. I testify that He hears and answers our every prayer. I know that His Son, Jesus Christ, paid the price of all of our sins and that He wants us to come to Him. I know that the Father and the Son want us to pass the tests of life. I testify that They have prepared the way for us. Through the Restoration of the gospel in the last days, the way is made clear for us. We can know the commandments. Today I wish to bear witness of God’s power of deliverance. At some point in our lives we will all need that power. Every person living is in the midst of a test. We have been granted by God the precious gift of life in a world created as a proving ground and a preparatory school. The tests we will face, their severity, their timing, and their duration will be unique for each of us. But two things will be the same for all of us. They are part of the design for mortal life. First, the tests at times will stretch us enough for us to feel the need for help beyond our own. And, second, God in His kindness and wisdom has made the power of deliverance available to us. There are many different tests, but today I will speak of only three..For each, the power of deliverance is available—not to escape the test but to endure it well. First: We can feel overcome with pain and sorrow at the death of a loved one. Second: Each of us will struggle against fierce opposition—some of which comes from dealing with our physical needs and some from enemies. Third: Each of us who live past the age of accountability will feel the need to escape from the effects of sin. Each of these tests can provide the opportunity for us to see that we need the power of God to help us pass them well. Good people around you will try to understand your grief at the passing of a loved one. They may feel grief themselves. The Savior not only understands and feels grief but also feels your personal grief that only you feel. And He knows you perfectly. He knows your heart. So He can know which of the many things you can do that will be best for you as you invite the Holy Ghost to comfort and bless you. He will know where it is best for you to start. Sometimes it will be to pray. It might be to go to comfort someone else. The Lord can inspire us to reach out for the power of deliverance from our grief in the way best suited to us. We can invite the Holy Ghost in humble prayer. We can choose to serve others for the Lord. We can testify of the Savior, of His gospel, and of His restoration of His Church. We can keep His commandments. All of those choices invite the Holy Ghost. It is the Holy Ghost who can comfort us in the way suited to our need. Even though the body is a magnificent creation, keeping it functioning is a challenge that tests us all. For too many in the world it is hard to find enough food and clean water to get through the next day. Everyone must struggle through illness and the effects of aging. There is anger and hatred in the world around us, and some of it will at times be directed at us. As the Prophet Joseph learned, the opposition grew as he became more valuable to the Lord’s purposes. In education and in life you will face stumbling blocks and opposition. You can and must go forward with confidence. If you start determined to qualify for God’s power of deliverance, not just in education but also in all the trials of mortality, you will succeed. You will be strengthened. You will be guided around and through barriers. Help and comfort will come. Your faith in Heavenly Father and the Savior will be increased. You will be strengthened to resist evil. And you will feel the gospel of Jesus Christ working in your life. All of us will at times struggle to feel free from the effects of sin. Only the Savior had the power to resist every temptation and never sin. So the most important and most difficult trial for us all is to become clean and to know that we are. Deliverance always requires humility before God. It takes submission to His will. It takes prayer and the willingness to obey. It takes serving others out of love for them and for the Savior. And it always requires and invites the Holy Ghost. Many of you have felt the result of frequent contact with the Holy Ghost. It may have been in your missionary service, where you needed deliverance many times. The Holy Ghost came to comfort and to guide you. As that recurred again and again, you may have noticed a change in yourself. The temptations that once troubled you seemed to fade. People who once seemed difficult began to appear more lovable. You began to see almost unreasonable potential in very humble people. You came to care more about their happiness than about your own. God the Father lives and loves us. I know that. His plan of happiness is perfect, and it is a plan of happiness. Jesus Christ was resurrected, as we will be. He suffered so that He could succor us in all of our trials. He paid the ransom for all of our sins and those of all of Heavenly Father’s children so that we could be delivered from death and sin. I know that in the Church of Jesus Christ the Holy Ghost can come to comfort and to cleanse us as we follow the Master. I leave you my witness and my love, and I bless you that you may receive sufficient comfort and succor in your times of need, through all the tests and trials of your life. We will need divine protection in our journey through this last dispensation as it moves toward its climactic end. [A young mother] seemed to be concerned primarily about physical dangers for her family..Yet many others feel as well the increasing influence of the adversary of our souls in the world around us. The greater hazards in our journey home to our Heavenly Father are that we and those we love might not be sanctified and purified and therefore not able to be there together. Joseph and Sidney had chosen to follow the Lord’s command with resolute determination whatever the consequences..The Lord gave the promises of protection and succor they needed and that you and I will need for ourselves and our loved ones. The Lord protects, guides, and watches over those who are His trusted friends in His work. His work and that of His Father and our Father is to bring to pass the immortality and eternal life of the children of God. And Satan, the enemy of our happiness, opposes those who serve the Lord. He watches over [His faithful servants]. He sends help to strengthen and sustain them. I have seen it for myself as you have. The Lord knows both the hearts and the needs of His friends who are on His errands. The Spirit will warn [my missionary granddaughter] away from danger…And she will feel by the Spirit that the Lord watches over her, knows her heart, and that she is under the protection of His power. That will banish fear and dismiss discouragement quickly when it comes, as it will come. More than you may know, you are part of the Lord’s promise to go with His servants on their challenging journeys in life..He sends friends. He sends the Holy Ghost to you and through you to the people He loves, watches over, and goes with. The Savior has always been the protector of those who would accept His protection. In our own time, we have been warned with counsel of where to find safety from sin and from sorrow. One of the keys to recognizing those warnings is that they are repeated. One of the ways we may know that the warning is from the Lord is that the law of witnesses, authorized witnesses, has been invoked. When the words of prophets seem repetitive, that should rivet our attention and fill our hearts with gratitude. Looking for the path to safety in the counsel of prophets makes sense to those with strong faith. When a prophet speaks, those with little faith may think that they hear only a wise man giving good advice. Then if his counsel seems comfortable and reasonable, squaring with what they want to do, they take it. If it does not, they consider it either faulty advice or they see their circumstances as justifying their being an exception to the counsel. When we reject the counsel which comes from God, we do not choose to be independent of outside influence. We choose another influence. We reject the protection of a perfectly loving, all-powerful, all-knowing Father in Heaven, whose whole purpose, as that of His Beloved Son, is to give us eternal life, to give us all that He has, and to bring us home again in families to the arms of His love. In rejecting His counsel, we choose the influence of another power, whose purpose is to make us miserable and whose motive is hatred. Every time in my life when I have chosen to delay following inspired counsel or decided that I was an exception, I came to know that I had put myself in harm’s way. Every time that I have listened to the counsel of prophets, felt it confirmed in prayer, and then followed it, I have found that I moved toward safety. God led me to safety along a path which was prepared with loving care, sometimes prepared long before. Only those who had faith and who themselves received confirming revelation saw both the danger and the way to safety. The Savior holds responsible those to whom He delegates priesthood keys. With those keys comes the power to give counsel that will show us the way to safety. Those with keys are responsible to warn even when their counsel might not be followed..When we honor the keys of that priesthood channel by listening and giving heed, we tie ourselves to a lifeline which will not fail us in any storm. [Heavenly Father] knew that in mortality we would be in grave danger, the worst of it from the temptations of a terrible adversary. That is one of the reasons why the Savior has provided priesthood keys so that those with ears to hear and faith to obey could go to places of safety. Sometimes we will receive counsel that we cannot understand or that seems not to apply to us, even after careful prayer and thought. Don’t discard the counsel, but hold it close. We are blessed to know where to look and how to listen for the voice that will fulfill the promise of the Lord that He will gather us to safety. I pray for you and for me that we will have humble hearts, that we will listen, that we will pray, that we will wait for the deliverance of the Lord which is sure to come as we are faithful. I pray that wherever we are and whatever duties we have in the priesthood of God, we will be united in the cause to bring the gospel to all the world. Whether it is in the large ward where the new deacon will perform his duty to share the gospel and build up the kingdom or in the tiny group far away where the new priest serves, they will be one in purpose. The deacon will be inspired by the love of God to reach out to a friend not yet a member. He will include his friend in some service or activity in the Church and then invite him and his family to be taught by the missionaries. To those who are baptized, he will be the friend they will need. It was the love of God and the love for their friends and neighbors that unified them to serve the people. Since you know that the Lord always prepares a way to keep His commandments, you can expect that He will do that for each of you. The Lord made it clear at the very start of this last dispensation that we were to take the gospel to all the world. What He said to the few priesthood holders in 1831 He says to the many now. Whatever our age, capacity, Church calling, or location, we are as one called to the work to help Him in His harvest of souls until He comes again. When it was announced in 2002 that missionary work would become the responsibility of the bishops, I marveled. I’d been one. It seemed to me they were already carrying a load close to their limits in ministering to the members and directing the organizations in the ward. One bishop I knew saw it not as an added duty but as an opportunity to draw the ward together in a great cause where every member became a missionary. If you will be diligent and obedient in the priesthood, treasures of spiritual knowledge will be poured out upon you. You will grow in your power to resist evil and to proclaim the truth that leads to salvation. You will find joy in the happiness of those you lead toward exaltation. Your family will become a place of learning. I testify that the keys of the priesthood have been restored. President Thomas S. Monson holds and exercises those keys. God lives and knows you perfectly. Jesus Christ lives. You were chosen for the honor of holding the sacred priesthood. The priesthood holders who learn well together always seem to me to have great peacemakers among them. You see peacemaking in priesthood classes and in councils. It is the gift to help people find common ground when others are seeing differences. It is the peacemaker’s gift to help people see that what someone else said was a contribution rather than a correction. Love invites the Holy Ghost to be present to confirm truth. And the joy of learning divine truths creates love in the hearts of people who shared the experience of learning. The reverse is true as well. Discord or jealousy inhibits the ability of the Holy Ghost to teach us and inhibits our ability to receive light and truth. With all the variety of our circumstances, we have a need in common. It is to learn our duties in the priesthood and to grow in our power to perform them. Learn what the Lord expects of you, make a plan to do it, act on your plan with diligence, and then share with others how your experience changed you and blessed others. It begins with their learning to know whose service they are in and for what purpose. When that goes down into their hearts, it makes all the difference. You will become more diligent as you feel the magnitude of the trust God has placed in you. Think of Him and how He honors you when you perform your priesthood service. As you remember Him, you will be determined to perform that sacred service, as nearly as you can, as well and faithfully as He did. The Lord is our perfect example of diligence in priesthood service. He is our captain. He called us. He goes before us. He chose us to follow Him and to bring others with us. The Savior’s example gives me courage to press on. His labors in mortality were finished, but He entered the spirit world determined to continue His glorious work to save souls. He organized the work of the faithful spirits to rescue those who could still be made partakers of the mercy made possible by His atoning sacrifice. Whenever we remember Him, it becomes easier to resist the temptation to want a rest from our priesthood labors. We must have remembered Him today, and so we are here to learn our duties, determined to do what we are covenanted to do, in all diligence. And because of His example we will endure to the end of the tasks He gives us in this life and be committed to do the will of His Father forever, as He was and is. This is the Lord’s Church. He called us and trusted us even in the weaknesses He knew we had. He knew the trials we would face. By faithful service and through His Atonement, we can come to want what He wants and be what we must be to bless those we serve for Him. As we serve Him long enough and with diligence, we will be changed. We can become ever more like Him. Ponder deeply and diligently in the scriptures and in the words of living prophets. Persist in prayer for the Holy Ghost to reveal to you the nature of God the Father and His Beloved Son. Plead that the Spirit will show you what the Lord wants you to do. Plan to do it. Promise Him to obey. Act with determination until you have done what He asked. And then pray to give thanks for the opportunity to serve and to know what you might do next. The thirst for education that comes with the change the gospel brings can be a blessing or a curse, depending on our motives. If we continue to seek learning to serve God and His children better, it is a blessing of great worth. If we begin to seek learning to exalt ourselves alone, it leads to selfishness and pride, which will take us away from eternal life. That is one of the reasons we should always put spiritual learning first. The real life we’re preparing for is eternal life. Secular knowledge has for us eternal significance. Our conviction is that God, our Heavenly Father, wants us to live the life that He does. We learn both the spiritual things and the secular things “so we may one day create worlds [and] people and govern them” (The Teachings of Spencer W. Kimball). All we can learn that is true while we are in this life will rise with us in the Resurrection. And all that we can learn will enhance our capacity to serve. When we put God’s purposes first, He will give us miracles. If we pray to know what He would have us do next, He will multiply the effects of what we do in such a way that time seems to be expanded. Too often we use many hours for fun and pleasure, clothed in the euphemism “I’m recharging my batteries.” Those hours could be spent reading and studying to gain knowledge, skills, and culture. Our education must never stop. If it ends at the door of the classroom on graduation day, we will fail. We cannot waste time entertaining ourselves when we have the chance to read or to listen to whatever will help us learn what is true and useful. Insatiable curiosity will be our hallmark. A great teacher is always studying. When you put the spiritual things first in your life, you will be blessed to feel directed toward certain learning, and you will be motivated to work harder. You will recognize later that your power to serve was increased, and you will be grateful. Part of the tragedy you must avoid is to discover too late that you missed an opportunity to prepare for a future only God could see for you. You are interested in education, not just for mortal life but for eternal life. When you see that reality clearly with spiritual sight, you will put spiritual learning first and yet not slight the secular learning. In fact, you will work harder at your secular learning than you would without that spiritual vision. It is clear that our first priority should go to spiritual learning. For us, reading the scriptures would come before reading history books. Prayer would come before memorizing those Spanish verbs. A temple recommend would be worth more to us than standing first in our graduating class. But it is also clear that spiritual learning would not replace our drive for secular learning. The Lord and His Church have always encouraged education to increase our ability to serve Him and our Heavenly Father’s children. For each of us, whatever our talents, He has service for us to give. In a world that is being darkened by evil images and dishonest messages, you have been blessed to recognize more easily the flashes of light and truth. You have learned for yourself that light grows brighter as you receive it gladly. It will become brighter and brighter until the perfect day when we will be in the presence of the Source of the light. You were tutored by Him before you came into this life. He helped you understand and accept that you would have trials, tests, and opportunities perfectly chosen just for you. You learned that our Father had a plan of happiness to get you safely through those trials and that you would help bring others safely through theirs. I was struck by how much my mother had filled a role in her family similar to the role the Nephite prophets had filled in their families by staying close to relatives they wanted to bring to the gospel of Jesus Christ. The Lord has provided ways for us to feel love in families that can continue forever. Young people in the Church today are feeling their hearts turn to their families. They are searching for names of family members who did not have the opportunity to receive the ordinances of salvation in this life. They take those names to the temple. When they enter the waters of baptism, they have the opportunity to feel the love of the Lord and of the family members for whom they are performing proxy ordinances. Those of you who perform ordinances for family members are reaching out in love, as did the sons of Mosiah and the prophet Nephi. Like them, you will feel joy for those who accept your offering. I bear testimony that the feelings of love you have for your family members—wherever they may be—are a fulfillment of the promise that Elijah would come. It is a blessing to live in the time when the promise of hearts turning is being fulfilled. Mildred Bennion Eyring felt that urge in her heart. She loved her brother’s family, and she reached out to them. They felt their hearts turn in love to Aunt Mid because they knew she loved them. When you choose whether to make or keep a covenant with God, you choose whether you will leave an inheritance of hope to those who might follow your example. As a part of our family’s inheritance of hope, [Heinrich Eyring] left a history to his descendants. In that history I can feel his love for those of us who would follow him. In his words I feel his hope that his descendants might choose to follow him on the path back to our heavenly home. He knew it would not be one great choice to make to do so but many small choices. If you let Him be the leader of your family, things will work out. After all we can do in faith, the Lord will justify our hopes for greater blessings for our families than we can imagine. He wants the best for them and for us, as His children. When you were baptized, your ancestors looked down on you with hope. … They rejoiced to see one of their descendants make a covenant to find them. I have found again the assurance that a loving God sends help in answer to prayer in this sacred work of redeeming our families, which is His work and His glory and to which we have pledged our hearts. There are more resources to search out your ancestors than there have ever been in the history of the world. The Lord has poured out knowledge about how to make that information available worldwide through technology that a few years ago would have seemed a miracle. With those opportunities there comes greater obligation to keep our trust with the Lord. After you find the first few generations, the road will become more difficult. The price will become greater. As you go back in time, the records become less complete. As others of your family search out ancestors, you will discover that the ancestor you find has already been offered the full blessings of the temple. Then you will have a difficult and important choice to make. You will be tempted to stop and leave the hard work of finding to others who are more expert or to another time in your life. But you will also feel a tug on your heart to go on in the work, hard as it will be. Many of your deceased ancestors will have received a testimony that the message of the missionaries is true. When you received that testimony you could ask the missionaries for baptism. But those who are in the spirit world cannot. The ordinances you so cherish are offered only in this world. Someone in this world must go to a holy temple and accept the covenants on behalf of the person in the spirit world. President Smith also saw the leaders the Savior called to take the gospel to Heavenly Father’s children in the spirit world. He named some of them: Father Adam, Mother Eve, Noah, Abraham, Ezekiel, Elijah, prophets we know from the Book of Mormon, and some from the last days, including Joseph Smith, Brigham Young, John Taylor, and Wilford Woodruff. Think of the power of those missionaries to teach the gospel and to touch the hearts of your ancestors. It is not surprising that Wilford Woodruff said while he lived that he believed few, if any, of the ancestors of the Latter-day Saints in the spirit world would choose to reject the message of salvation when they heard it. To you I wish to say how much the Lord loves you and trusts you. And, even more, I wish to tell you how much He depends on you. For each of us, life is a journey. Heavenly Father designed it for us out of love. The Lord protects, guides, and watches over those who are His trusted friends in His work. His work and that of His Father and our Father is to bring to pass the immortality and eternal life of the children of God. Heavenly Father has assigned us to a great variety of stations to strengthen and, when needed, to lead travelers to safety. Our most important and powerful assignments are in the family. They are important because the family has the opportunity at the start of a child’s life to put feet firmly on the path home. We have trials to face because our Heavenly Father loves us. His purpose is to help us qualify for the blessing of living with Him and His Son, Jesus Christ, forever in glory and in families. Heavenly Father hears your prayers, He loves you. He knows your name. He loves you beyond your ability to comprehend. The family unit is fundamental not only to society and to the Church, but to our hope for eternal life. God has devised means to save each of His children. For many, that involves being placed with a brother or a sister or a grandparent who loves them no matter what they do. The way for loving parents and grandparents and all of God’s servants will not be easy in a decaying world. We cannot force God’s children to choose the way to happiness. God cannot do that because of the agency He has given us. Heavenly Father and His Beloved Son love all of God’s children no matter what they choose to do or what they become. From before the world was, a loving Father in Heaven and His Beloved Son loved and worked with those who They knew would wander. God will love them forever. We can always take courage from the assurance that we all once felt the joy of being together as a member of the beloved family of our Heavenly Father. One of the great tributes the Savior can give is to call us “friends.” We know that He loves with a perfect love all of His Heavenly Father’s children. Yet for those who have been faithful in their service with Him, He reserves this special title. We become His friends as we serve others for Him. He is the perfect example of the kind of friend we are to become. He wants only what is best for His Heavenly Father’s children. Their happiness is His happiness. When we reach out to give succor and to lift a burden, He reaches with us. He will lead us to those in need. He will bless us to feel what they feel. As we persist in our efforts to serve them, we will more and more be given the gift of feeling His love for them. That will give us courage and strength to reach out again and again in faithfulness. And, in time and in eternity, we will feel the joy of being welcomed to the company of His faithful friends. All of us need true friends to love us, to listen to us, to show us the way, and to testify of truth to us so that we may retain the companionship of the Holy Ghost. You must be such a true friend. To keep the promise we made in the waters of baptism “to bear one another’s burdens.” It is to be a friend. There are limits on what friends can do to help the ones who must endure. It is the new members who must pray. It is they who must rely on the strength they will receive in answers to their prayers. They must choose for themselves in faith to be baptized, trusting in their perfect friend, the Savior. They must choose in faith in Him to repent, to be humble and contrite. They must choose to receive the gift of the Holy Ghost. The true friend is vital. There are important ways for us to share the new member’s burden that it may be bearable. We can love, listen, show, and testify. He is prepared to help you be a friend who understands even those you have just met, if you ask in faith. He loves those whom you must serve and who will become your true friends forever. Each act of kindness to anyone becomes a kindness to the Savior because He loves all of Heavenly Father’s children. First, we can, out of faith in Him, give a broken heart and a contrite spirit. We can repent and make sacred covenants with Him. With all the kindnesses we give for Him, the greatest we can offer is to point those we love and serve toward Him, the only source of eternal life. Second, you can give Him the gift of doing for others what He would do for them. With all the kindnesses we give for Him, the greatest we can offer is to point those we love and serve toward Him, the only source of eternal life. Almost everything that I’ve been able to accomplish as a priesthood bearer is because individuals who knew me saw things in me that I couldn’t see. What matters is not the activity but the feelings that come as you do it. I have discovered a good test for identifying activities with the potential to make a great difference in a young person’s life. It is that they suggest the activity out of an interest they feel has come to them as a gift from God. God has prepared us with special gifts to serve Him beyond our fondest hopes. You can be inspired to recognize, as I did, specific gifts and unique opportunities for each of the youth you love and lead. I can promise you that you will bless them to help them recognize the spiritual gifts with which they were born. Every person is different and has a different contribution to make. No one is destined to fail. As you seek revelation to see gifts God sees in those you lead in the priesthood—particularly the young—you will be blessed to lift their sights to the service they can perform. With your guidance, those you lead will be able to see, want, and believe they can achieve their full potential for service in God’s kingdom. I’ve always had a daydream of being a great gift-giver. I can picture someone opening my gift with tears of joy and a smile, showing that the giving, not just the gift, has touched a heart. Great gift-giving involves three things: you feel what the other feels, you give freely, and you count sacrifice a bargain. There was sacrifice, but it was made for a greater return to them—my happiness. Anyone can let the person who gets a gift know of the giver’s sacrifice. But only an expert can let you sense that sacrifice brings joy to the giver because it blesses the receiver. We have the power to make others great gift-givers by what we notice. We can make any gift better by what we choose to see—and we can, by failing to notice, make any gift a failure. If you do not now have children, you probably will someday. Can you see their faces? Can you see them somewhere, sometime, in mortal danger? Can you feel the fear in their hearts? Would you like to freely give? What sacrifice will it take to write the letter your heart will want to send? You won’t be able to make that sacrifice in the hour before the postman comes. Nor will it be possible in a day or even a week. It may take years, but you can start preparing now. You may well want to give a gift to the Savior. But he seems to have everything, doesn’t he? Well, not quite. He doesn’t have all of us with him again, forever—not yet. I hope we are touched enough by the feelings of his heart to sense how much he wants to know each of us is coming home to him. We can’t give that gift to him in one day or in one Christmas. But we could show him today that we are on the way. All around us are people he loves, and he wants to help them—through us. The process of cleansing our lives seems to make us more sensitive, more generous, more pleased to share what means so much to us. I pray that we will freely give. I pray that we will be touched by the feelings of others, that we will give without feelings of compulsion or expectation of gain, and that we will know that sacrifice is made sweet to us when we treasure the joy it brings to another heart. For Latter-day Saints, the Sabbath is a day of gratitude and love. when we feel gratitude for what He has done for us, we will feel His love for us and our love for Him. You may even feel love and gratitude, as I do, for the Holy Ghost, who Heavenly Father has promised will always be with us as we remain faithful to the covenants we have made. We can count all those blessings every Sunday and feel grateful. I have felt that transformation of growing gratitude for blessings and a love of God increasing across the Church. It seems to accelerate among members of the Church in times and places where there are trials of their faith, where they have to plead to God for help to even carry on. I can promise you your prayers will be answered, and as you act on the answers you will receive, you will find joy in the Sabbath, and your heart will overflow with thankfulness. God asks that we give thanks to Him for whatever blessings we receive from Him. It is easy for us to become mechanical in our prayers of gratitude, often repeating the same words but without the intent to give our thanks as a gift of the heart to God. We are to “give thanks … in the Spirit” (D&C 46:32) so we can feel real gratitude for what God has given us. The Holy Ghost brings back memories of what God has taught us. And one of the ways God teaches us is with His blessings; and so, if we choose to exercise faith, the Holy Ghost will bring God’s kindnesses to our remembrance. I pray that we may make a continuing effort in faith to recognize, remember, and give thanks for what our Heavenly Father and our Savior have done and are doing to open the way home to Them. To find gratitude and generosity when you could reasonably find hurt and resentment will surprise you. King Benjamin’s teaching had a miraculous effect. Gratitude for what they had led to faith unto repentance. That led to forgiveness. That produced new gratitude. And then King Benjamin taught that, if we can remember and so remain grateful, we will retain a remission of our sins through all the losses and the gains of life. You could have an experience with the gift of the Holy Ghost today. You could begin a private prayer with thanks. You could start to count your blessings, and then pause for a moment. If you exercise faith, and with the gift of the Holy Ghost, you will find that memories of other blessings will flood into your mind. If you begin to express gratitude for each of them, your prayer may take a little longer than usual. Remembrance will come. And so will gratitude. Remembrance is the seed of gratitude which is the seed of generosity. Gratitude for the remission of sins is the seed of charity, the pure love of Christ. I pray that we will remember and be grateful for the gift of the Atonement and the gift of the Holy Ghost, which make that journey possible. I realized that trying to remember had allowed God to show me what He had done. … I became ever more certain that our Heavenly Father hears and answers prayers. I felt more gratitude for the softening and refining that come because of the Atonement of the Savior Jesus Christ. As I kept at [journaling], something began to happen. As I would cast my mind over the day, I would see evidence of what God had done for one of us that I had not recognized in the busy moments of the day. … More than gratitude began to grow in my heart. Testimony grew. I came home late from a Church assignment.… Just as I got to the door, I heard in my mind … ‘I’m not giving you these experiences for yourself. Write them down.’… And as I did, I understood the message I had heard in my mind. I was supposed to record for my children to read, someday in the future, how I had seen the hand of God blessing our family. You can’t find in their journals records of the positions they held, just of the instructions they heard, and knew were from God, and followed. Heavenly Father knows and loves you as His spirit child. With the power of the Atonement of Jesus Christ working and with the Holy Spirit guiding, you can feel now and will feel in the world to come the family love your Father and His Beloved Son want so much for you to receive. As you live worthy of the celestial kingdom, the prophetic promise that “family arrangements will be more wonderful than you can imagine” will be yours. All of us want happiness for those we love, and we want as little pain for them as possible. As we read the accounts of happiness—and of pain—in the Book of Mormon, our hearts are stirred as we think of our loved ones. We know that the path to happiness is well marked. We also know that maintaining happiness is not easy unless, as with the Nephites after the Savior’s visit, “the love of God” dwells in our hearts. That love was in the hearts of the Nephites because they kept the law that made it possible. With the companionship of the Holy Ghost, our hearts can change so that we want and welcome the love of our Heavenly Father and of the Lord Jesus Christ. The way to get the love of God into our hearts is simple, as is the way to lose the feeling of that love in our hearts. The happiness we want for our loved ones depends on their choices. As much as we love a child, an investigator, or our friends, we cannot force them to keep the commandments so that they qualify for the Holy Ghost to touch and change their hearts. So the best help we can give is whatever leads those we love to watch over their own choices. Love your wife. It will take faith and humility to put her interests above your own in the struggles of life. You have the responsibility to provide for and to nurture the family with her while serving others. That can at times consume all the energy and strength you have. Age and illness may increase your wife’s needs. If you choose even then to put her happiness above your own, I promise you that your love for her will increase. Another crucial source for that feeling of being loved is love from other children in the family. Consistent care of brothers and sisters for each other will come only with persistent effort by parents and the help of God. The Spirit at times softened the hearts of thousands and replaced hatred with love. You will succeed through..a sure bond of love with your wife, with the Lord’s help in turning the hearts of your children to each other and to their parents, and with love guiding you to correct and exhort in a way that invites the Spirit. We are under covenant both to lift up those in need and to be witnesses of the Savior as long as we live..We will be able to do it without fail only as we feel love for the Savior and His love for us. As we are faithful to the promises we have made, we will feel our love for Him. You will have the comfort of His love and feel the answer of His drawing closer as you reach out your arms in giving service to others. As you bind up the wounds of those in need and offer the cleansing of His Atonement to those who sorrow in sin, the Lord’s power will sustain you. Of all the gifts our loving Heavenly Father has provided to His children, the greatest is eternal life. That gift is to live in the presence of God the Father and His Beloved Son forever in families. Only in the highest of the kingdoms of God, the celestial, will the loving bonds of family life continue. Our loving Heavenly Father knows our hearts. His purpose is to give us happiness. And so He gave the gift of His Son to make possible the joy of family bonds that continue forever. The Savior sent the Prophet Elijah to Joseph Smith to restore the keys of the priesthood. With those keys came the sealing power, offering God’s greatest gift to His children—eternal life in families bound together forever. As we endure in that faithfulness, the Holy Ghost will confirm our hope and confidence that we are on the path to eternal life, to live in families forever in the celestial kingdom. To all of those whose personal experience or whose marriage and children—or absence thereof—cast a shadow over their hopes, I offer my witness: Heavenly Father knows and loves you as His spirit child. While you were with Him and His Beloved Son before this life, They placed in your heart the hope you have of eternal life. With the power of the Atonement of Jesus Christ working and with the Holy Spirit guiding, you can feel now and will feel in the world to come the family love your Father and His Beloved Son want so much for you to receive. Our priesthood obligation is to put our families and the families of those around us at the center of our concern. Every major decision should be based on the effect it will have on a family to qualify for life with Heavenly Father and Jesus Christ. There is nothing in our priesthood service as important as this. Every priesthood effort and every priesthood ordinance is intended to help Heavenly Father’s children be changed through the Atonement of Jesus Christ to become members of perfected family units. It follows that “the great work of every man is to believe the gospel, to keep the commandments, and to create and perfect an eternal family unit,” and to help others do the same. Everything we do should have celestial marriage as its focus and purpose. The teacher in the Aaronic Priesthood can see in his home teaching assignment an opportunity to help the Lord change the lives of a family. I was never sure how I could exhort in a way that would move a family toward eternal life without offending or seeming to criticize. I have learned that the only exhortation that changes hearts comes from the Holy Ghost. That occurs most often as we bear testimony of the Savior, who was and is the perfect family member. As we focus on our love for Him, harmony and peace will grow in the homes we visit. The Holy Ghost will attend us in our service to families. In considering marriage, he will see that he is choosing the parents of his children and the heritage they will have. He will make the choice with earnest searching and prayerful consideration. He will ensure that the person he marries shares his ideals for family and his convictions of the Lord’s purpose for marriage and that she is a person to whom he would be willing to trust his children’s happiness. My hope is that..You will treat your wife and children the way Heavenly Father has treated you. You will follow the example and direction of the Savior to lead your family in His way. When the Lord speaks to all in the family, His counsel is to love and support each other. In our home and in our priesthood service, the greatest value will be in the small acts that help us and those we love work toward eternal life. Those acts may seem small in this life, but they will bring everlasting blessings in eternity. There is nothing that has come or will come into your family as important as the sealing blessings. There is nothing more important than honoring the marriage and family covenants you have made or will make in the temples of God. Let me suggest four things you can do as a priesthood father to lift and lead your family home again to be with Heavenly Father and the Savior..First, gain and keep a sure witness that the keys of the priesthood are with us and held by the President of the Church..The second imperative is to love your wife..Third, enlist the entire family to love each other..The fourth opportunity to lead your family in the Lord’s way comes when discipline is needed. We can meet our obligation to correct in the Lord’s way and then lead our children toward eternal life. When we with faith control our tempers and subdue our pride, the Holy Ghost gives His approval, and sacred promises and covenants become sure. Give children opportunities to pray, when they can pray, for each other in the circle who need blessings. Discern quickly the beginnings of discord and recognize acts of unselfish service, especially to each other. When they pray for each other and serve each other, hearts will be softened and turned to each other and to their parents. The greatest joys and the greatest sorrows we experience are in family relationships. Children are to be born into a family where the parents hold the needs of children equal to their own in importance. And children are to love parents and each other. I give counsel to husbands and wives. Pray for the love which allows you to see the good in your companion. Pray for the love that makes weaknesses and mistakes seem small. Pray for the love to make your companion’s joy your own. Pray for the love to want to lessen the load and soften the sorrows of your companion. Now I give counsel to the parents of a wandering child. The Savior is the perfect example of persisting in love. You felt the approval of Heavenly Father for having done what Jesus did. You have felt it in your family when you asked the pardon of your spouse or forgave a child for some mistake or disobedience. These moments will come more often as you try to do the things you know Jesus would do. As we read what the proclamation tells us about the family, we can expect—in fact, we must expect—impressions to come to our minds as to what we are to do. And we can be confident it is possible for us to do according to those impressions. Since there is enough and to spare, the enemy of human happiness as well as the cause of poverty and starvation is not the birth of children. We can understand why our Heavenly Father commands us to reverence life and to cherish the powers that produce it as sacred. If we do not have those reverential feelings in this life, how could our Father give them to us in the eternities? Family life here is the schoolroom in which we prepare for family life there. There are things we can start to do now that have to do with providing for the spiritual and physical needs of a family. There are things we can do now to prepare, long before the need, so we can be at peace. Have you noticed husbands and wives who feel pinched for lack of money choose for a solution ways to make their family income keep rising but soon find that the pinch is there whatever the income? There is an old formula which goes something like this: Income five dollars and expenses six dollars: misery. Income four dollars and expenses three dollars: happiness. We cannot control what others choose to do, and so we cannot force our children to heaven, but we can determine what we will do. And we can decide that we will do all we can to bring down the powers of heaven into that family we want so much to have forever. The family unit is fundamental not only to society and to the Church but also to our hope for eternal life. We begin to practice in the family, the smaller unit, what will spread to the Church and to the society in which we live in this world. Confidence grows as you come to see that He called you through His servants. My encouragement is to help you know that when you do your part, the Lord adds His power to your efforts. Any calling we receive in the Lord’s kingdom requires more than our human judgment and our personal powers. Those calls require help from the Lord, which will come. After Elder Eyring had served for three difficult years and upon the death of the mission president, Henry was nominated and sustained as president of the mission in a meeting held on October 6, 1858. He was surprised and as shocked as a new deacon would be. You can pray to know His will, and with the honest desire to do whatever He asks you to do, you will receive an answer. It is my prayer that every priesthood holder will reach out in faith to rescue every soul for whom he is responsible. God will add His power to His servant’s efforts. I testify that He has called you and me into His service knowing our capacities and the help we will need. He will bless our efforts beyond our fondest expectations as we give our all in His service. Our human tendency is to be impatient with the person who cannot see the truth that is so plain to us. We must be careful that our impatience is not interpreted as condemnation or rejection. You asked some already heavily burdened, knowing that the greater the sacrifice, the greater the compensation they will receive from the Lord. All of us are blessed with responsibility for others. To hold the priesthood of God is to be held responsible by God for the eternal lives of His children. That is real, that is wonderful, and at times that can feel overwhelming. Most of you have discovered that your priesthood duties will stretch you to the point that you wonder if you can stretch that far. Recognize and welcome those whom the Lord sends to help us..see in every assignment the opportunity to strengthen another. Time and again over your life, the Lord has been giving you the experiences to build strength, courage, and determination. He knew how much you would need that to serve Him. We can expect in our service to have help sent to us at the right time who will see strength in us and lift us up. And we can look forward to being the one sent by the Lord to encourage another. Like that servant of Elisha, there are more with you than those you can see opposed to you. Some who are with you will be invisible to your mortal eyes. The Lord will bear you up and will at times do it by calling others to stand with you. The promise of angels to bear us up is real. When those feelings of inadequacy strike us, it is the time to remember the Savior. He assures us that we don’t do this work alone. The more faithful service you give, the more the Lord asks of you. Your smile is a happy one because you know that He increases our power to carry the heavier load. The tough part of that reality, however, is that for Him to give you that increased power you must go in service and faith to your outer limits. It is like building muscle strength. You must break down your muscles to build them up. You push muscles to the point of exhaustion. Then they repair themselves, and they develop greater strength. Increased spiritual strength is a gift from God which He can give when we push in His service to our limits. The Church of Jesus Christ of Latter-day Saints has always been led by living prophets and apostles, who receive constant guidance from heaven. The servants of God fast and pray to receive the message He has for them to give to those who need revelation and inspiration. To gain the great benefits available from hearing living prophets and apostles, we must pay the price ourselves of receiving revelation. The Lord loves every person who might hear His message, and He knows the hearts and circumstances of each one. He knows what correction, what encouragement, and what gospel truth will best help each person to choose his or her way along the path to eternal life. Human judgment and logical thinking will not be enough to get answers to the questions that matter most in life. We need revelation from God. we will need not just one revelation in a time of stress, but we need a constantly renewed stream. We need not just one flash of light and comfort, but we need the continuing blessing of communication with God. That wonderful process of revelation begins, ends, and continues as we receive personal revelation. The revelation of a parent has its lasting effect in the personal revelation that continues in the child. The value of the revelation depends on those who are being led receiving confirming revelation. Continuing revelation comes to stake presidents to lift them above their own wisdom and capacities. God pours out revelation, through the Holy Ghost, on His children. As you listen in this conference to the words of those God has called to speak for Him, I pray that you will receive the confirming revelation you need to find your way on the journey home again, to dwell with Him in a sealed family forever. It is clear that putting spiritual learning first does not relieve us from learning secular things. On the contrary, it gives our secular learning purpose and motivates us to work harder at it. If we will keep spiritual learning in its proper place, we will have to make some hard choices of how we use our time. My father was once asked by a member of the Quorum of the Twelve Apostles to write a short paper on science and religion. My father was a famous scientist and a faithful priesthood holder. But I can still remember the moment he handed me the paper he had written and said, “Here, before I send this to the Twelve, I want you to read it. You will know if it is right.” He was 32 years older than me and immeasurably more wise and intelligent. I still am strengthened by that trust from a great father and priesthood man. I knew that his trust was not in me but that God could and would tell me what was true. The change that comes [from conversion] is a desire to be someone even better, to reach for more light, and to give greater service to others. Those desires always lead to a hunger for education, to learn what is true, what is useful, and what is beautiful. There should never be a conscious choice to let the spiritual become secondary as a pattern in our lives. Never. That will lead to tragedy. The tragedy may not be obvious at first, nor may it ever be clear in mortal life. But remember, you are interested in education not for life, but for eternal life. When you see that reality clearly with spiritual sight, you will put spiritual learning first and yet not slight the secular learning. In fact, you will work harder at your secular learning than you would without that spiritual vision. No service that matters can be given over a lifetime by those who stop learning. A great teacher is always studying. It was from those wonderful days at Ricks College that I learned something to add to my prayers as a teacher. I learned to ask that my students would pray in faith that the Spirit would come to teach us all. What is interesting about my father, is not so much what he did, but what he was. He was a simple Mormon boy from Pima, Arizona, a boy with a deep faith. His achievements never changed him much. The great test of life is to see whether we will hearken to and obey God’s commands in the midst of the storms of life. There is another even more important preparation we must make for tests that are certain to come to each of us. That preparation must be started far in advance because it takes time. What we will need then can’t be bought. It can’t be borrowed. It doesn’t store well. And it has to have been used regularly and recently. What we will need in our day of testing is a spiritual preparation. Spiritual storms are already raging. We can expect that they will worsen until the Savior returns. However much faith to obey God we now have, we will need to strengthen it continually and keep it refreshed constantly. We can do that by deciding now to be more quick to obey and more determined to endure. Learning to start early and to be steady are the keys to spiritual preparation. Procrastination and inconsistency are its mortal enemies. Let me suggest to you four settings in which to practice quick and steady obedience. One is the command to feast upon the word of God. A second is to pray always. A third is the commandment to be a full-tithe payer. And the fourth is to escape from sin and its terrible effects. Each takes faith to start and then to persevere. And all can strengthen your capacity to know and obey the Lord’s commands. Decisions now to exercise faith and be steady in obedience will in time produce great faith and assurance. That is the spiritual preparedness we all will need. And it will qualify us in the moments of crisis to receive the Lord’s promise that “if ye are prepared ye shall not fear.” That will be true when we face the storms of life and the prospect of death. I know that through the Holy Ghost we can learn what God would have us do. I testify that He can give us the power to do what He asks of us, whatever it is and whatever trials may come. I pray that we will choose to obey the Lord quickly, always, in quiet times and in storms. As we do, our faith will be strengthened, we will find peace in this life, and we will gain the assurance that we and our families can qualify for eternal life in the world to come. We build the faith to pass the tests of obedience over time and through our daily choices. We can decide now to do quickly whatever God asks of us. And we can decide to be steady in the small tests of obedience which build the faith to carry us through the great tests, which will surely come. The testimony will not be a recital of the message. It will be an affirmation of some truth that the Spirit can carry into the hearts of those who will be praying for help, for divine direction, and to receive the pure love of Christ. True testimony will be given to the speakers. Their words may be few, but they will be carried into the heart of the humble listener who has come to the conference hungry for the good word of God. If you listen with the Spirit, you will find your heart softened, your faith strengthened, and your capacity to love the Lord increased. There is a difference between receiving a testimony of truth and being truly converted. Conversion will not be a single event or something that will last for just one season of life but will be a continuing process. Life can become brighter until the perfect day, when we will see the Savior and find that we have become like Him. As we read, ponder, and pray over the word of God, we will come to love it. The Lord puts it in our hearts. As we feel that love, we will begin to love the Lord more and more. With that will come the love for others that we need in order to strengthen those whom God puts in our path. The Lord taught us that when we are truly converted to His gospel, our hearts will be turned from selfish concerns and turned toward service to lift others as they move upward to eternal life. To obtain that conversion, we can pray and work in faith to become the new creature made possible by the Atonement of Jesus Christ. There are things you can do early, when those you love are young. Remember that daily family prayer, family scripture study, and sharing our testimony in sacrament meeting are easier and more effective when children are young. Young children are often more sensitive to the Spirit than we realize. The Holy Ghost can bring all things to their remembrance, but the words of scriptures and hymns will last the longest. Those memories will exert a pull that may bring them back when they wander for a time, possibly for years, from the pathway home to eternal life. Testimony requires the nurturing by the prayer of faith, the hungering for the word of God in the scriptures, and the obedience to the truth. You will need that living and growing testimony to fortify you and lead your path to eternal life. And with it you will become the transmitters of the Light of Christ to your brothers and sisters across the world and across generations. Testimony will come to you in pieces as parts of the whole truth of the gospel of Jesus Christ are confirmed. For instance, as you read and ponder the Book of Mormon, verses you have read before will appear new to you and bring new ideas. Your testimony will grow in breadth and in depth as the Holy Ghost confirms that they are true. Your living testimony will expand as you study, pray, and ponder in the scriptures. Like a growing plant, it must be nurtured or it will wither. Frequent and heartfelt prayers of faith are crucial and needed nutrients. Obedience to the truth you have received will keep the testimony alive and strengthen it. Obedience to the commandments is part of the nourishment you must provide for your testimony. In addition to choosing to be obedient, we must ask in prayer for testimony of truth. There is danger in neglecting prayer. There is danger to our testimony in only casual study and reading of the scriptures. They are necessary nutrients for our testimony. Feasting on the word of God, heartfelt prayer, and obedience to the Lord’s commandments must be applied evenly and continually for your testimony to grow and prosper. Each time you choose to try to live more like the Savior, you will have your testimony strengthened. You will come in time to know for yourself that He is the Light of the World. You will come to feel light growing in your life. It will not come without effort. But it will come as your testimony grows and you choose to nurture it. Those who have prepared carefully for the fast and testimony meeting won’t need to be reminded how to bear testimony should they feel impressed to do it in the meeting. A testimony is a simple expression of what we feel. I share with you the obligation to be a witness for God at all times and in all places that I will be in as long as I live. And I share with you the confidence that God can grant us the power to keep all our covenants. Even before baptism, a child or an adult can have the Holy Ghost testify to their hearts of sacred truth. They must act on that testimony to retain it, but it will guide them toward goodness, and it can lead them to accept and keep the covenants which will in time bring them the companionship of the Holy Ghost. Since it is the Holy Ghost who testifies of sacred truth, we can do at least three things to make that experience more likely for our families. First, we can teach some sacred truth. Then we can testify that we know what we have taught is true. And then we must act so that those who hear our testimony see that our actions conform with what we said was true. The Holy Ghost will then confirm to them the truth of what we said and that we knew it to be true. Plan for our weekly family night to be a setting for the bearing of testimony. Be sure that some truth of the gospel of Jesus Christ is taught simply and plainly, so that even a child could understand. A child could do the teaching. Read the scriptures aloud together as a family. It may take unusual determination and inspiration to find a time and a setting. But reading and hearing the words of life from the scriptures will invite the Holy Ghost to confirm their truth. Kneel together in humble prayer as a family, each having the opportunity to be voice. There may be times when the prayer seems rote and when those not praying let their minds wander. But there will be other priceless moments when someone will petition in faith for real needs and the Holy Ghost will touch hearts with testimony. Fast and allow your children to fast once a month before the meeting in which they will partake of the Lord’s Supper, hear others bear testimony, and perhaps themselves feel prompted to testify. Even teaching, testifying, and living true to that testimony may not pass on the legacy. Great and good parents have done that and then seen their families or some in their families reject that testimony. There is reason for us to have great hope and optimism. It comes first from our testimony of the nature of our Heavenly Father: he loves our family members; he is their Heavenly Father as well as ours. It also comes from our testimony of the mission of Jesus Christ: he paid the price to redeem them. I pray that we may, with all our hearts for all our lives, offer testimony of the truth to our families. As a priesthood holder responsible for the spiritual survival of some of Heavenly Father’s children, you will then move to help without waiting for a cry, “Man down!” Even a best friend or other leaders or parents may not see what you have seen. You may have been the only one to sense by inspiration the warning cry. The courage to act and their selfless service came from feeling that they were responsible for the lives, the happiness, and the safety of comrades. Such a feeling of responsibility for others is at the heart of faithful priesthood service. Our comrades are being wounded in the spiritual conflict around us. So are the people we are called to serve and protect from harm. You will need bravery and you will need boldness because you are enlisted in the Lord’s army in the last dispensation. This is not a time of peace. That has been so since Satan arrayed his forces against our Heavenly Father’s plan in the premortal existence. The Savior warns us that we must watch the sheep as He does. He gave His life for them. The members of the Church are the sheep. They are His, and we are called by Him to watch over them. We are to do more than warn them against danger. We are to feed them. He watches with us. He who sees all things, whose love is endless, and who never sleeps—He watches with us. He knows what the sheep need at every moment. By the power of the Holy Ghost, He can tell us and send us to them. And we can by the priesthood invite His power to bless them. But His warning to Peter is to us as well. The wolf who would kill the sheep will surely tear at the shepherd. So we must watch over ourselves as well as others. As a shepherd, we will be tempted to go near the edges of sin. But sin in any form offends the Holy Ghost. You must not do anything or go anywhere that offends the Spirit. You cannot afford that risk. Should sin cause you to fail, you would not only be responsible for your own sins but for the sorrow you might have prevented in the lives of others had you been worthy to hear and obey the whisperings of the Spirit. Our ability to touch others with our warning voice matters to all who are covenant disciples of Jesus Christ. Because the Lord is kind, He calls servants to warn people of danger. That call to warn is made harder and more important by the fact that the warnings of most worth are about dangers that people don’t yet think are real. Here is the charge given to each of the members of The Church of Jesus Christ of Latter-day Saints: “Behold, I sent you out to testify and warn the people, and it becometh every man who hath been warned to warn his neighbor” (D&C 88:81). That command and warning of danger was given to those called as missionaries at the start of the Restoration. But the duty to warn our neighbor falls on all of us who have accepted the covenant of baptism. I know that it begins with love. Second, we will need to be better examples of what we invite others to do..The third thing we must do better is to invite with testimony. Love and example will open the way. *Feel free to share your respectful comments, and/or favorite quotes from President Henry B. Eyring! This entry was posted in Articles, LDS Living, LDS Quotes and tagged general conference, Henry B. Eyring, lds inspiration, lds quotes. Bookmark the permalink.